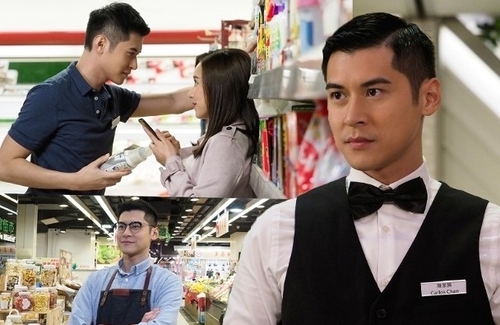 Yesterday, EEG artist Carlos Chan (陳家樂) filmed a commercial in which he acted as a “super worker,” playing the roles of a supermarket assistant, delivery guy, and waiter. Carlos attracted a group of women while filming at the street market. In the commercial, he showcased his charm by using his eyes to stare into the female customer’s and speedily swapped apples for another patron. However, he is not a “super worker” in real life and quite clumsy as well.